My family and I just returned from 9 days away on vacation. This is the first time since I started doing freelance blogging and social media back in January of 2009 that I have taken a trip and left my computer — and my work — behind. I mentioned to my husband how much I anticipated our trip, our first vacation in so long, I told him. What about our trip to West Virginia? he asked. Don’t you remember? I worked the whole time, I reminded him. This time, since I have a regular job that includes paid vacation (a truly beautiful thing), I left my computer behind. I brought my iPhone along but purposely stayed away from Facebook, Twitter, and Google+. I looked at email daily, but non-commit-ally. I noticed QR codes, businesses displaying (or not displaying) their social media channels, and marketing strategies. On Sunday morning, after our first night camping, we went to a coffee shop in a nearby town. While we waited for them to open the doors at 9 am, I noticed a decal on the door indicating that the business was a favorite on Google Places. We settled in to the comfortable chairs. I sipped my mocha and checked out the shop’s brochure/menu. My girls happily occupied in a game of checkers, I sneaked to the computer they had available for patrons. I quickly found the shop’s Facebook fan page, liked it, and posted a kind review on the wall. Though I had left my work behind, my thoughts still swirled with thoughts about work. During those first few days away, I chatted with store owners about their Facebook marketing strategies and scanned QR codes. Then after a few days I noticed something new. We camped for the first few nights of our trip. Headed to the bathroom at bedtime, I saw the moon: round, full, and bright. A few nights later, I noticed the moon, diminished. When I am at home, I do not notice this, the waxing and waning of the moon. The crystal clear water of the Great Lakes. The way my three daughters played so lovingly with one another: digging in the sand, splashing in the waves. The peaceful sound of waves crashing on the shores of Lake Michigan. I noticed that it took some time for me to shift my focus, to mentally break away from thoughts of work. I noticed that once I disconnected, I felt lighter, free-er than I have for a while. Tell me something! What do you notice when you disengage and disconnect from social media? The coffee shop we visited was Bud’s — I highly recommend that you visit if you ever find yourself in or around Interlochen, Michigan. The winery? 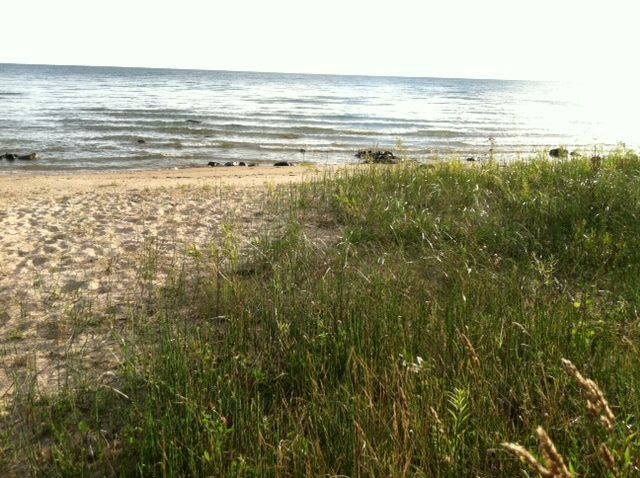 L. Mawby on Michigan’s beautiful Leelanau penninsula. Also highly recommended. Sounds like a vacation. Yay! We got away to my in-law’s place in the Mountains for a couple of days. My mother-in-law asked me, “What are you going to do?” After all, everyone else had plans for the day. My response: “Nothing.” No structure or demands are real time off for me. Nothing that day turned out to be reading, a nap, and a walk down to the creek. You left your computer home, but I took mine. I always do. It’s important to have it there, “just in case” and it’s actually more restful for me to have that option if I need it, but I never look at the computer when there. So here’s what I noticed about as I read your post: It takes some time to disconnect. The intent was there, the resolve. But it took a couple of days for you to disconnect from everything so that you could really see what you hadn’t been seeing when you were surrounded by FB and Twitter and Google. When I disengage–I notice the quiet. I LOVE Leelenau Peninsula! It is absolutely my favorite place in the world (and i’ve been to a lot of different countries). I used to go to Traverse City every October with a group of girlfriends from work. I’m so glad you had a good time there. I’m confused as to why every business needs a facebook page. I only know about this phenomenon because you talk about it frequently. When i’m out and about, I don’t notice at all if places advertise a facebook page. Since i’m not in the marketing biz, i don’t understand what it accomplishes. As a regular ole consumer, what does it do for me if my coffee shop has a facebook page? So sorry for the delayed response! I don’t know that EVERY business needs a fan page, although I think a fan page could be helpful for every business. The value to someone like you is the chance to communicate directly — and easily — with businesses to share complaints, concerns, praise, and encouragement. You use Facebook regularly, so it is likely much easier for you to like a page and interact with the business from where you already are then it would be to write a letter or send an email. The other value is that you may be able to find out about insider specials, deals, or coupons that you might not otherwise know about. Of course, you would likely only choose to “like” those brands that you feel very strongly to and stay closely connected with, which is fine, of course. Sometimes I like a page because I want to get to know the business more, remember it for the future, or make sure my friends can find out about it. Is it Time to Give Your Social Accounts a Refresh?